Source: Rev. John Mason Neale and Rev. Thomas Helmore, eds., Hymnal Noted, Part I. (London: Novello & Co., 1852), Part II (London: Novello & Co., 1856), #15, p. 42. 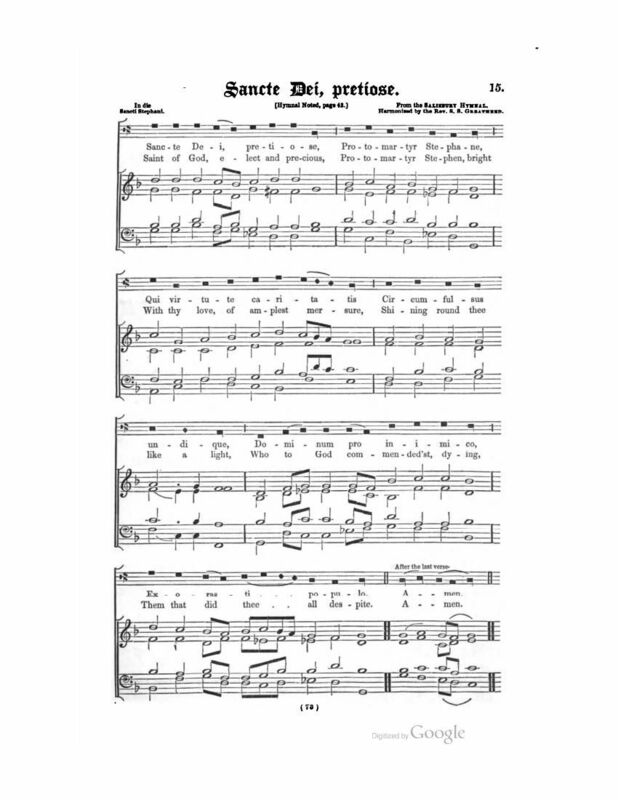 "From the York Hymnal"
Also found in J. H. Hopkins, ed., Great Hymns of the Church Compiled by the Late Right Reverend John Freeman Young (New York: James Pott & Company, 1887), #75, p. 117. Rev. John Mason Neale and Rev. Thomas Helmore, eds., Hymnal Noted, Part I. (London: Novello & Co., 1852), Part II (London: Novello & Co., 1856), #15, p. 42. Sheet Music from Thomas Helmore, Accompanying Harmonies to the Hymnal Noted. Part I (London: Novello, Ewer and Co., and Masters and Son, 1852), Part II (London: Novello and Co., Joseph Masters and J. T. Hayes, 1858), #15, citing the Sarum Breviary for the text. Sheet Music from J. H. Hopkins, ed., Great Hymns of the Church Compiled by the Late Right Reverend John Freeman Young (New York: James Pott & Company, 1887), #75, p. 117. Hopkins gives the source as "Hymnal Noted." Harmonized by H. R. Schroeder." The following note is from John Julian, The Dictionary of Hymnology (1892), p. 992. Sancte Dei pretiose, protomartyr Stephane. [St. Stephen.] 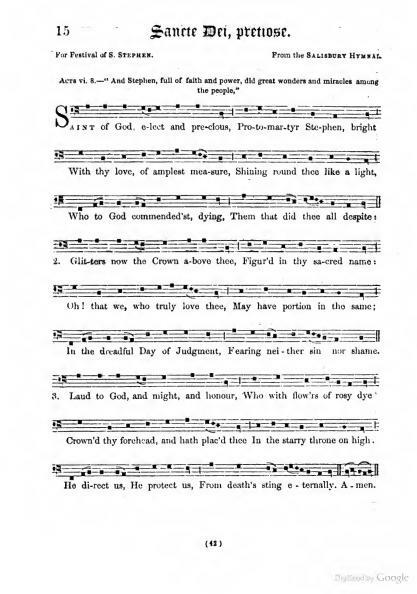 The original form of this hymn is in 3 stanzas of 3 lines (ii. "Funde preces," iii. "Gloria et honor"). 1. Saint Of God, Elect And Precious. 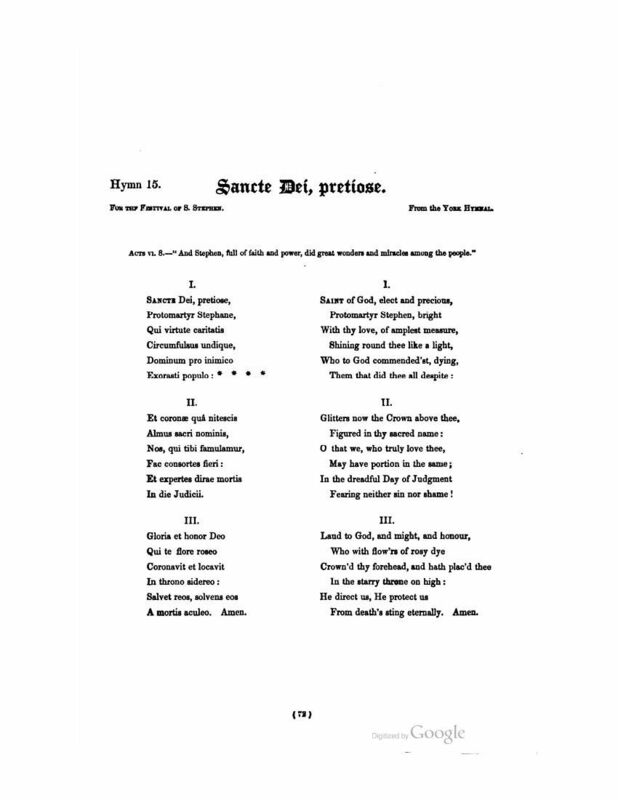 By J. M. Neale, of the 3 stanzas form of the text, in the Hymnal Noted, 1852 ; the Hymner, 1882, &c.
2. Saint of God, Beloved Stephen. By W. J. 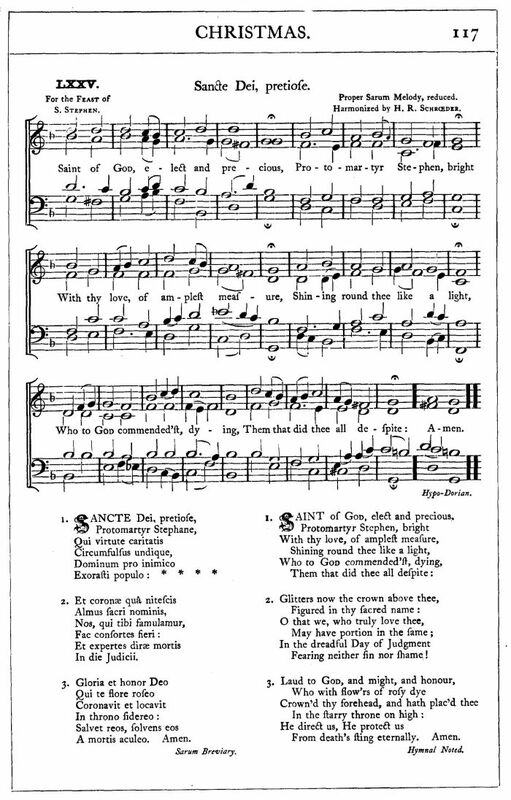 Blew, in his Church Hymn & Tune Book, 1852-55, Christmas, No. 18, and in Rice's Selections from the same, 1870, No. 12. This, in 6 stanzas of 6 lines, is from the text of Daniel abridged.